Just a few miles south of Long Beach, nestled on a quiet knoll overlooking the Port of llwaco, the Inn welcomes you in gracious style. Relax with a glass of wine and a good book in the elegant parlor with fireplace. Enjoy one of our nine guest rooms, each with a private bathroom, or choose a suite with fireplace and private entrance. Rooms come with an expansive continental breakfast. The Inn is an easy stroll to the Columbia Pacific Heritage Museum, the Port of Ilwaco, gift shops, art galleries, bookstores and more. Experience the spirit of the Peninsula’s past in this 1913 Craftsman home. Nestled in a quiet, residential area that is a short walk to the ocean beach, as well as to the shops in Ocean Park. The warm blend of period furnishings, with Native American artifacts, celebrates the owners’ regional heritage. Country breakfast served in the large, formal dining room overlooking beautiful perennial gardens. Each of the 3 bedrooms has a private bath. Gracious common areas include wrap-around front porch, inviting living room with fireplace, and an eclectic book selection in the cozy library. We are a non-smoking home and have resident dogs, therefore we are unable to accommodate visiting pets. Children 12 and older are welcome. China Beach is called a retreat for a reason. In this serene setting deer, waterfowl and bald eagles are frequent guests. All creatures, including you, share a view of the mouth of the Columbia River and Bakers Bay. A combination of American, European and Asian antiques and original artwork define the décor. Relax in your private spa tub. This is the ultimate getaway for a couple’s or friends’ retreat. Built in 1896, The Shelburne Hotel is the longest continuously operating hotel in Washington State. During its long life, the Shelburne has been a center of the Long Beach Peninsula community, as well as providing a sanctuary to artists, intellectuals and weary travelers the world over. Now under new stewardship, the Shelburne tradition of elegant, historic surroundings, innovative local cuisine and community preservation is intact for generations to come. 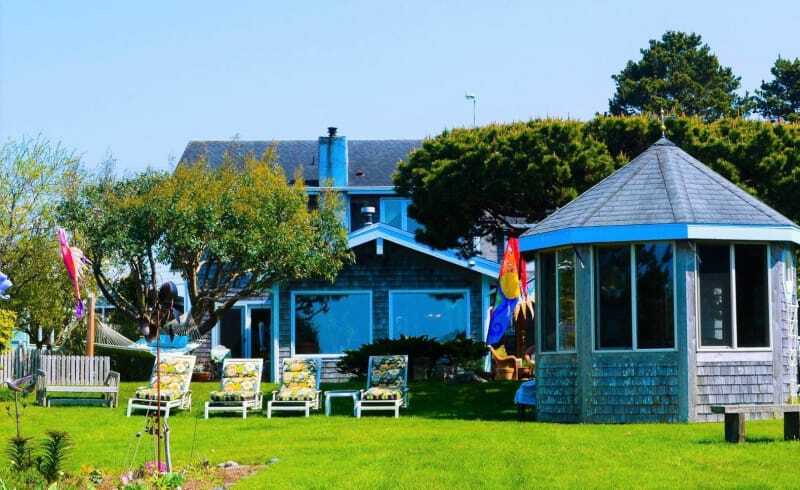 If you love three-course “Epicurean delightful breakfasts”, five beautiful bedrooms with luxurious linens, private baths, large common areas with fireplaces and a spectacular oceanfront setting, Boreas Inn is your getaway. Your retreat is quiet, except for ocean sounds, complete with lush robes, fresh flowers, every amenity & brownies! Stroll Boreas’ beach path to the 8-mile Discovery Trail and Long Beach Boardwalk; soak in the private hot tub by the dunes. Boreas Inn has received many awards for their customer service, “seriously good food” & unforgettable romance. “Anybody in the hospitality industry should visit Boreas to see what First Class is all about.” 2015 Trip Advisor “Hall of Fame” 2016 KING5 TV’s #1 B&B. With the ocean just steps from our door, welcome to our oceanfront home! The 4 rooms on the second floor each have ocean views. Continental breakfast, quiet atmosphere – a relaxing retreat. Join us for a great stay at the beach.